You’ve worked hard to get to this point in your musical career. Now you’re ready to take your message to the masses. Your performance, and your audience, deserves a loudspeaker system that delivers the power and clarity of your vision—it deserves EUROLIVE Professional. 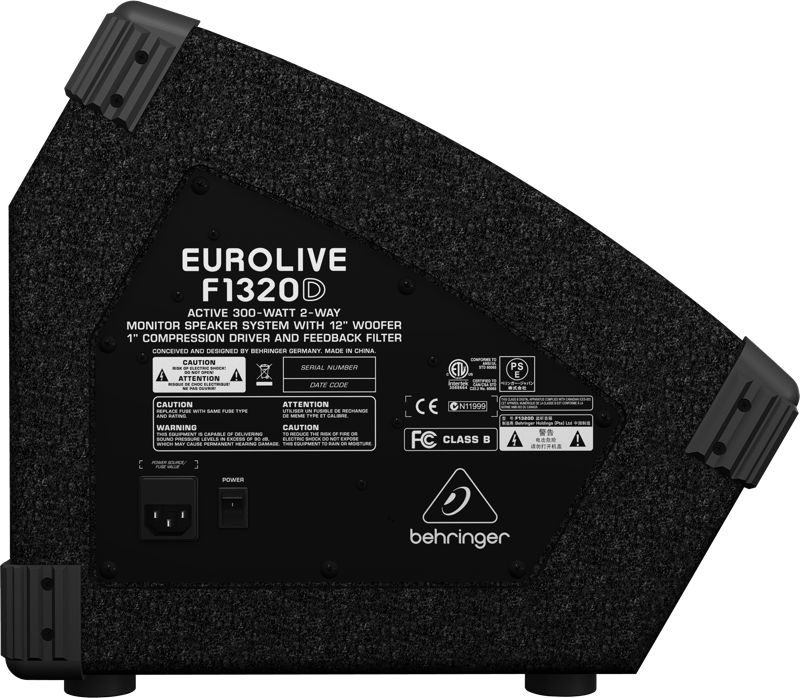 Since its introduction, the EUROLIVE F1220A active floor monitor has been wildly successful. Building on that legacy, we are proud to present the even more powerful EUROLIVE F1320D. 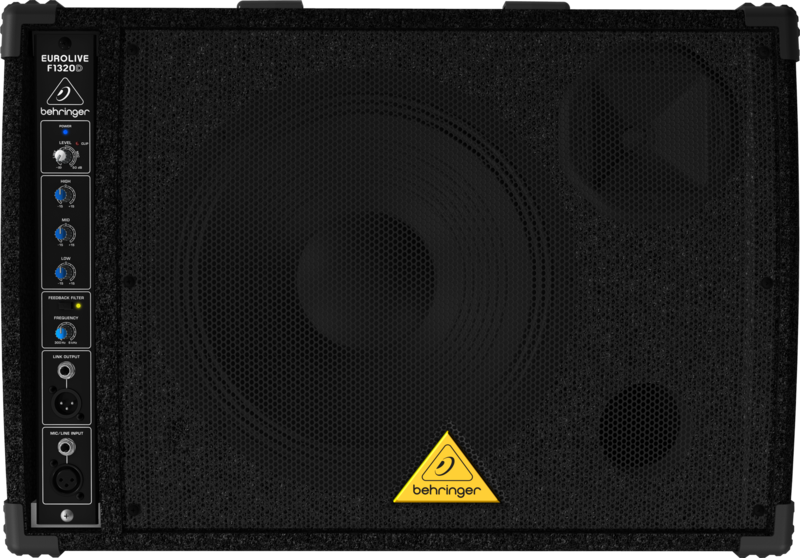 This 300-Watt active monitor system has its own 3-band EQ and dedicated volume knob, so you not only have control of the output, but you can tweak the highs, mids and lows for a clear, true sense of your performance. And thanks to our Class-D technology, the F1320D weighs less than 40 lbs (18 kg), making them easy to transport and set up. The built-in adjustable feedback filter helps eliminate annoying squeals and howls so you can crank the volume to a level where you can actually hear yourself above the raging chaos, otherwise known as your band. After all, the main reason to have a monitor is so you can hear yourself, right? The EUROLIVE F1320D helps you hear yourself better so you can perform up to your true potential. Our revolutionary Class-D amplifier technology enables us to make floor monitors that weigh about the same as their passive cousins, even with a built-in 300-Watt amplifier! Class-D amps are super-efficient little beauties that don’t generate as much heat as their conventional counterparts, so they don’t need massive heat sinks to keep them cool. We combine these powerful amplifiers with state-of-the-art switch-mode power supplies for noise-free audio, superior transient response and extremely low power consumption. While some manufacturers are content with putting off-the-shelf transducers in their boxes, we custom-design and build ours from scratch. We do this because the transducers (woofers and tweeters) are the part of the system you actually hear, and we want them to sound great. Our loudspeakers deliver truly impressive performance at levels that easily cut through stage clutter, even in the most demanding situations. We make our own because they have to be right—right for each application, and most importantly—right for you! The F1320D doesn’t just sound great, it gives you instant control of your monitor, even mid-performance—something passive monitors simply cannot deliver! Need more volume? Turn the LEVEL dial until the desired volume is reached, getting too much bass or treble? Just reach down and tweak the 3-band EQ (HIGH, MID, LOW) to tailor a rich, exciting sound. We’ve even provided the first line of defense against feedback, a dedicated FREQUENCY dial you can adjust to eliminate troublesome mic squeals. Total control is always right at your fingertips with the EUROLIVE F1320D. Big here, small there, lots of this, light on that—everyone’s got their preferences, but the EUROLIVE B215XL has proportions we can all agree upon. These loudspeakers pack a clean, punchy wallop (and can handle up to 1000 Watts), they are easy to lift by their recessed handles (38.7 lbs) and are available at insanely low prices. Who wouldn’t want to hook up with one of these beauties? These loudspeakers take everything musicians love about the original B212 loudspeakers and upgrade them with the same bass and treble/mid transducers found in our wildly popular B212A active version for even better sound and power handling. And with integrated overload protection circuitry, they arrive ready to push it to the limit without putting their high or low frequency drivers in danger. Big here, small there, lots of this, light on that—everyone’s got their preferences, but the EUROLIVE B212XL has proportions we can all agree upon. These loudspeakers pack a clean, punchy wallop (and can handle up to 800 Watts), they are easy to lift by their recessed handles (24 lbs) and are available at insanely low prices. Who wouldn’t want to hook up with one of these beauties? 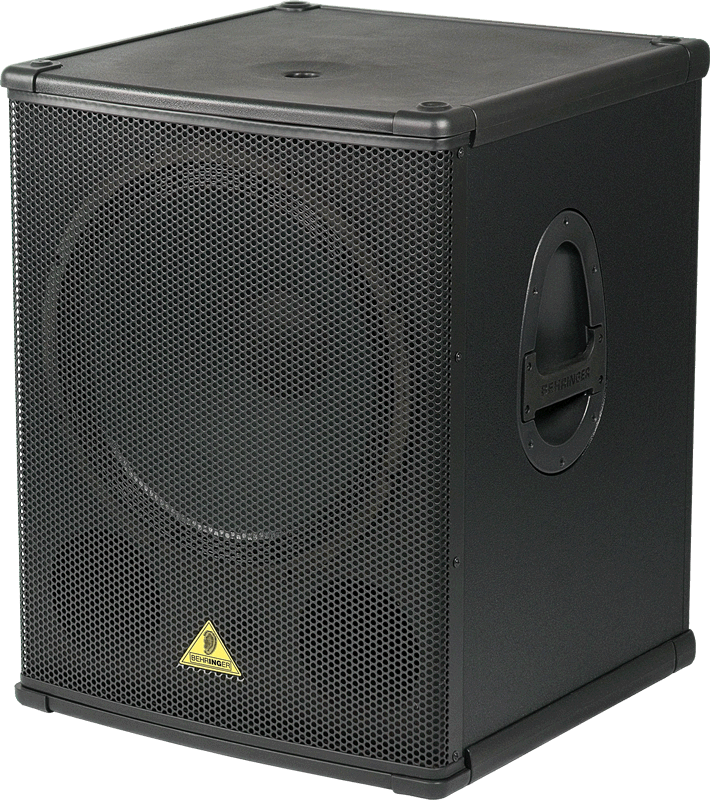 The B1800X PRO subwoofer is engineered to handle the demands of professional gigs, from small clubs to large stages. With its 1,800-Watts power handling capability, the B1800X cranks out massive amounts of aggressive bottom-end, making it the ideal way to add tremendous punch to your current sound system. In order to produce tight, deep bass, a loudspeaker has to move lots of air. 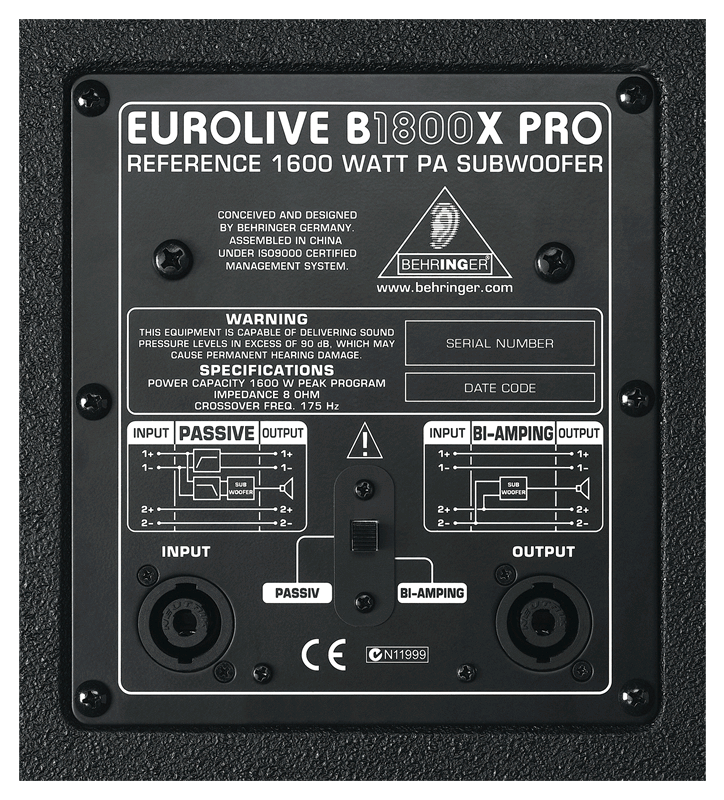 EUROLIVE Professional Series loudspeakers accomplish this by using powerful, long-excursion LF (Low Frequency) drivers that are handmade in our own factory. While some companies are content to use “off-the-shelf” drivers, we custom-design each LF driver to perfectly match its enclosure and application. The B1800X PRO features a powerful 18″ long-excursion LF driver in a tuned enclosure, providing rich, tight bass all the way down to 40 Hz. That’s extraordinarily deep bass that will shake the house right down to its foundation.